From the tip of his black Homburg to the crease in his cheviot trousers, he's the epitome of a stylish 1930s English gentleman. His only problem? The body he just discovered. Drew Farthering loves a good mystery, although he generally expects to find it in the pages of a novel, not on the grounds of his country estate. With the help of beautiful and whip-smart Madeline Parker, a guest from America, Drew proposes to use the lessons he’s learned reading his mysteries to solve the crime. Before long, he realizes this is no lark, and no one at Farthering Place is who he or she appears to be - not the butler nor blackmailer, the chauffeur nor embezzler. Trying hard to remain one step ahead of the killer - and trying harder to impress Madeline - Drew must decide how far to take this dangerous game. 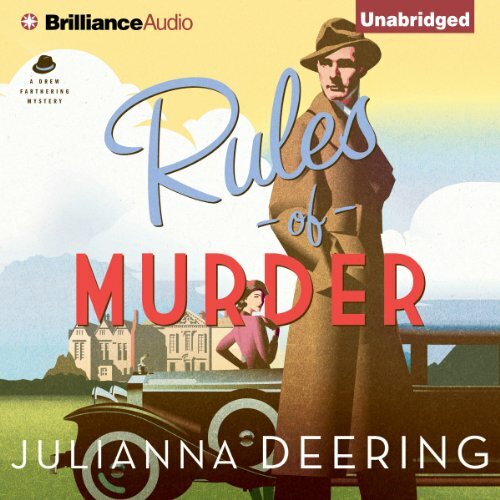 ©2013 DeAnna Julie Dodson (P)2013 Brilliance Audio, Inc.
From the tip of his black Homburg to the crease in his cheviot trousers, Drew Farthering is the epitome of a stylish 1930s English gentleman. His only problem? The body he just discovered. With the help of beautiful and whip-smart Madeline Parker, a guest from America, Drew proposes to use the lessons he’s learned reading his mysteries to solve the crime. Trying hard to remain one step ahead of the killer - and trying harder to impress Madeline - Drew must decide how far to take this dangerous game.